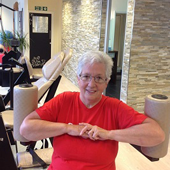 I started at Livia Club after having surgery following breast cancer. All the machines were carefully adjusted to help me aid recovery. "This year I fractured my arm in 3 places and as soon as my doctor allowed, I went back to Livia. My regular exercise has once again aided my recovery to the point where I only see a physiotherapist monthly and improvement has been so fast that after only 2 months, I have 80% movement which doctors said would take me 12-15 months! Livia staff helped me through 2 serious medical issues and I absolutely endorse Livia Club to all women of all ages and abilities".